(Concerning the Priests) Ezekiel 44:18 - "Linen turbans shall be on their heads, and linen undergarments shall be on their loins; they shall not gird themselves with anything which makes them sweat." Sweat is the result of exerting our own strength, so sweat speaks of a ministry that comes from our own efforts. If we are going to be the priests of the Lord, we must not take on anything that makes us sweat. Matthew 11:28-30 - "Come to Me, all who are weary and heavy-laden, and I will give you rest. Take My yoke upon you, and learn from Me, for I am gentle and humble in heart; and you shall find rest for your souls. For My yoke is easy and My load is light." A yoke speaks of work, but when we are yoked with the Lord, it will be His strength that does the work, and we just get carried along for the ride! It is the Spirit that He has given to us that will do the work, just as He did from the beginning. Acts 7:48 - "The Most High does not dwell in houses made by human hands." Acts 17:25 - "Neither is He served by human hands, as though He needed anything." All of our best efforts will not accomplish anything for Him. I AM SIMPLY CALLED TO OBEDIENCE AND ABIDING IN HIM. WHEN I COME TO REST IN HIM, HE WILL THEN MOVE THROUGH ME, AND I WILL ACTUALLY FIND REST AND REFRESHMENT AS HE DOES IT. It's time to let your expectation out of the box of fear and intimidation - He's taking your little portion into His BIG hands and causing supernatural multiplication in areas of your life, ministry, and CALLING as His sons and daughters. We have all heard that the atmosphere ofEXPECTATION is the breeding ground for miracles. Indeed, this is such a true declaration to keep in the forefront, especially NOW. Rise up in full faith and in the confidence our God knowing this is your hour of multiplication. Be not afraid of weariness, but see it as a season of watering; to where He will water you, and water you, and water you, and water you. When you run, you will carry the Rivers of Life to and fro, and also swim upstream, against adversity. 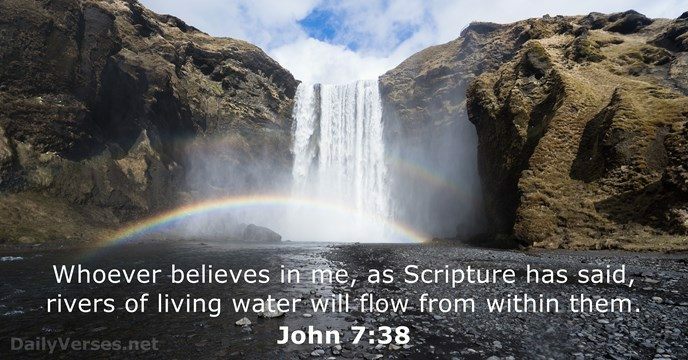 You will know and recognize the current of the Holy Spirit, and you will learn and recognize, how to flow with the His flowing. You will swim against the drowning currents and find Him as your personal lifeguard. You will understand, the current from under will cause you to rise up, to walk on the water, with the faith that He has been grooming in you for a long time. You, the branch, and the life that He deposits in you -- you then will deposit into withered trees, to those who are dry. The water that will be drawn up out of the root of their pain, you will merely pump it into the vein of their hopelessness. When you're in isolation, do not see it as a season of abandonment, but see it as the season of being prepared, behind closed doors, for presentation -- it will be a platform higher in the heavenlies, for He has promised you in His Word that He is taking His own from glory to glory in Christ Jesus.